Five Corners Trattoria (5 Esquinas Trattoria) serves up Italian pastas, pizzas, and Cuban drinks in an up and coming part of Old Havana. Ethnic food has always been a stretch in Cuba, limited supplies and almost zero immigration to the island have left a “rice and beans” stigma for serving the famous arroz con frijoles at every meal. 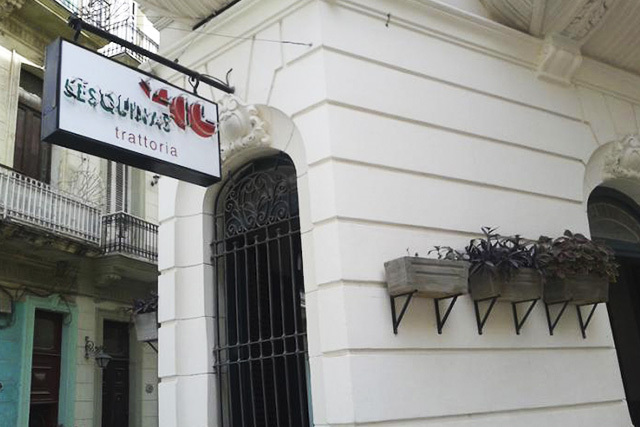 However the rapidly growing tourist market in Havana means new restaurants are trying to offer a more worldly fare. Five Corners Trattoria is an example of this culinary diversity. Situated in the northern part of Habana Vieja “Five Corners” name refers to its physical location; at the intersection of Espada, Cuarteles, and Habana streets; forming a 5 pointed star. Just a block away from Old Havana’s diminutive Plaza del Angel and the 300 year old Santo Angel Catholic Church. The Italian paladar is part of rapid growth drawing more visitors to this part of old town that was off the tourist map just a few years ago. The building itself is shaped like a slice of pizza, and tables spill out onto either side of its walls onto the pedestrian only street outside. Tall buildings and narrow streets mean there is shade most of the day, but the outdoor seating is prime at night. That is when the shadows cast out of old wooden doorways and the cool sea breeze from the Atlantic Ocean make Havana come alive to the senses. The food and drinks help as well. Mojitos and Cuba Libres are served in glasses that are more jar sized than the traditionally narrow Collins glass. This helps quench the summer thirst brought on by the Caribbean humidity. 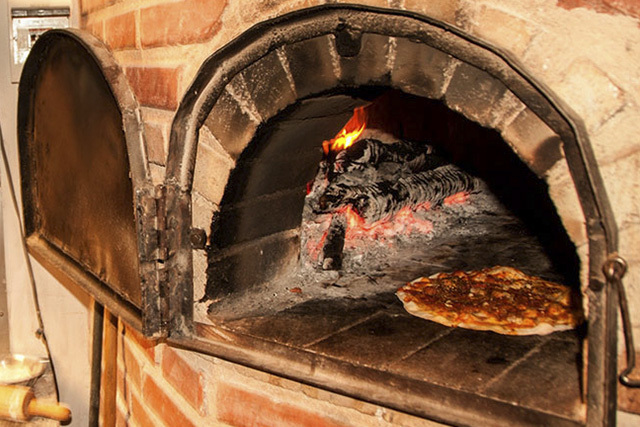 The cooks probably deserve a drink or two as well, considering Five Corners cooks its pizzas in two massive brick, wood-fired, ovens. The thin crust and ample toppings means you taste much more than bread. The menu ventures much further out than pizza of course, and even past what is normally expected in Cuba. The Lobster and Octopus Carpaccio (the former accented with mint) are standouts in the starter section. The pastas are ordered by type of pasta and sauce. Besides a half dozen traditional Italian and Mediterranean sounding offers the latter includes homemade reductions of rabbit and lamb sauces. The stuffed pastas offer inventive solutions for vegetarians visiting Cuba, including ravioli stuffed with dried fruits. The cocktail list is very basic, and the price is right as pretty much all drinks range between $3-4. When you are done with your meal you are in walking distance of Barbers Alley, just a few steps away on Habana St. There you will find another pedestrian only street with several bars/restaurants that offer outdoor seating and a calm yet lively environment where really loud live music doesn’t threaten to drown out your conversation. 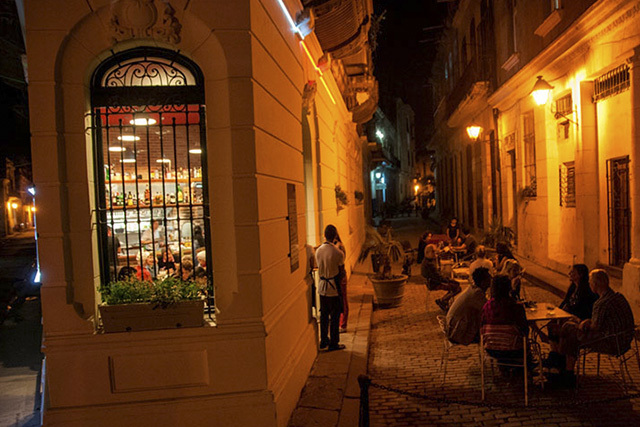 Five Corners Trattoria is a solid option for a romantic dinner or for a small group of friends that just want a chance to hang out in a part of Old Havana that isn´t infiltrated by tourism (yet). The sidewalk seating and food that gets away from the rice and beans staples help set this experience apart from the more common dining experience on the island. 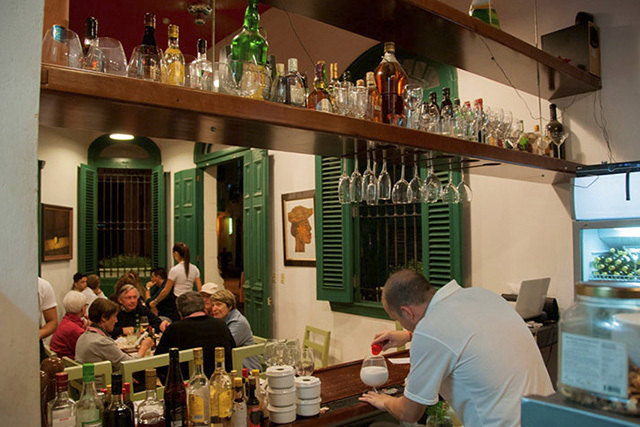 Five Corners Trattoria is open from 11AM- 11PM on the corner of Cuarteles and Habana St. in Old Havana. For reservations call 7860-6295.